At first I didn’t want to tell her what the word meant. Maybe it’s me wanting to let her hold on to her rose colored glasses a bit longer, to be blissfully unaware of flaws and what they mean. But perhaps the bigger possibility is that I didn’t want her to start questioning if she is flawed. Just as our talents and gifts set us apart and make us unique, so do our imperfections and blemishes. (They also keep us the same.) We just would much rather keep the flaws to ourselves. But we’ve all got them. Sometimes I get angry at my children’s behavior and react in a less than loving way. Sometimes I eat too much sugar. Sometimes I get frustrated with a situation and let it overwhelm me. Sometimes I don’t put my best foot forward. Sometimes I don’t take the time to meditate. And I’m sure if you ask those closest to me they can give many more examples of my not so flawless behavior. Life isn’t perfect, therefore living it isn’t either. So when my daughter asked me what a flaw is, it was hard for me to articulate. I can point out a flaw in the paint job in my baby’s nursery. I can notice a flaw in a car I’m renting for the weekend. I can see the flaws in my wood floor after my children go roller-skating in the living room. But our flaws, they’re not so static. Each situation that comes about is a new opportunity to get it right, to try again. We get do-overs all the time. Every morning that we wake up is a clean slate. And it’s not that I’m suggesting we divert from what we know is right in our heart, but rather that we give ourselves a break when we miss the mark. That we refrain from immediately beating ourselves up when we mess up or make a mistake. Because we aren’t going to get it right every time. No one is. It’s in the flaws that we can extend compassion to ourselves and to those we love. We can offer up love not despite the flaws but because of them. Admitting we are flawed softens us and connects us. Seeing where we are coming up short – for ourselves and others – and giving it another shot is what this human experience is all about. Self-acceptance means accepting the whole picture of who we are – flaws and all. Not succumbing to feeling inadequate, less than or unworthy because of our flaws is our challenge. Recognizing our flaws is where we begin to grow. Keeping them quiet is when we invite shame in. And shame is no friend to have. Flaws are our opportunities to try again, to keep going, to grow and extend our branches and to know more about who we are and recognizing ourselves in those around us. These flaws we share aren’t negatives, they are reminders that we are all doing the best we can with what we have. It’s where we can ask to be forgiven. It’s our choice to accept ourselves as we are and to know when we do there’s nowhere to go but up. Our flaws are the launch pads to a better, more loving place. So Adam, keep singing your song. There’s nothing more attractive than someone admitting he’s not perfect. 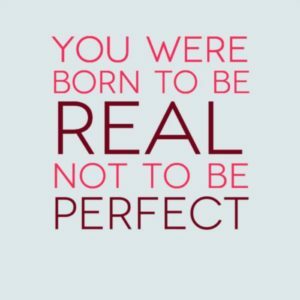 As for my daughter, you don’t have to be perfect either. All you have to be is yourself.